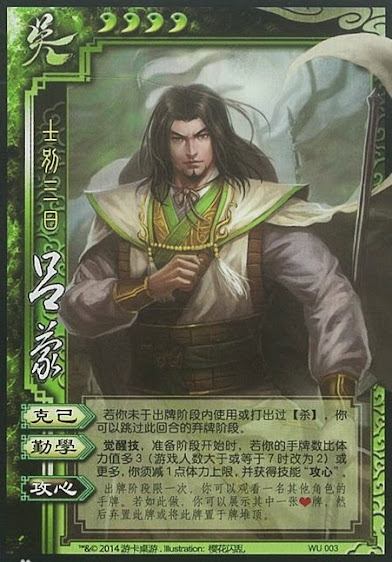 Once per game at the beginning of his turn, if Lu Meng has at least three more hand cards than health, Lu Meng must decrease his maximum by one and he acquires Strike at the Heart. In a game with seven or more, Lu Meng only needs two more cards than health. "Self Restraint" and " Strike at the Heart" are the same powers as the original and god versions of Lu Meng. "Diligence" reduces Lu Meng's maximum and gives him "Strike at the Heart". If Lu Meng continues to have enough cards in his hand, "Diligence" cannot activate multiple times. This reduces his maximum only once. When using "Strike at the Heart" on Xiao Qiao, Lu Meng can discard a spade since her "Beauty" makes these cards hearts.